Pregnant, belly fat with child, you stretch out inside the newly purchased inflatable raft. Dog and lover stare out at the water. Lover wears a life jacket and clings to the side of the raft. You read a Barbara Kingsolver novel and try to feel like you’re someone else. Without warning the dog jumps out of the raft and swims to shore. Then he darts after something. It doesn’t look good. The two of you yell for him to stop. You see the furry animal, your dog’s head shaking violently, hear the squeals. Then the old lady appears on the lawn, screaming at you to get your dog, grabbing her cat, kicking your dog. When you see the bloody cat, you feel sickened. You know you should stop, say something, do something, but it’s just too bleak. You call the dog, yell a feeble apology. The woman knows you, the lover, the dog, the unborn child, the four of you are doomed for failure. Nothing good will come from the four of you. She knows. You know. Everyone knows. “Go get him,” you command the lover. “I’m pregnant!” Your lame excuse for months and months to get out of anything upsetting. You feel like tipping the raft over. Maybe if the woman sees the lover drown she won’t feel so bad about the cat. A life for a life. You bring the raft to shore just past the woman’s house and the dog comes running. He’s covered in blood and you wonder how such a nice dog can turn so vicious. You think about how you’re supposed to become someone maternal, not someone who considers tipping a raft. 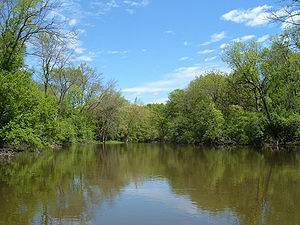 You drag the dog into the raft and take off again onto the slow-moving Des Plaines River. Once again, only trees line the shores. Just the three of you sitting uncomfortably in this small raft, wishing for a strong current. No one says anything for a while. You’re just turning the pages of your book, not really reading. Your lover continues to clutch the sides of the raft. He wants a beer, but since you’re not drinking, you tell him he should wait awhile longer. Let him suffer. The dog is bored and tries jumping out of the raft again. You catch him mid-jump and the raft starts to fill with water. Lover screams for dear life. You ignore him. The library book is ruined. You think of the fine you’ll pay. And how you haven’t finished the book. This trip was supposed to help the two of you move forward after he accused you of getting pregnant on purpose. Something symbolic to show that he’s willing to take risks and you’re capable of forgiveness. You wonder how much longer before you’ll reach the dam. You haven’t seen one other person in a canoe, a kayak, an air mattress. It was supposed to take two hours to float this stretch of the river, but it feels like it’s been an eternity. You can’t take it another minute and jump out with the dog. “The baby needs a swim,” you explain floating down the river with this unknown child. You float ahead of the raft and the dog runs along the shore, both of you leaving the lover to wonder. Diane Payne is the MFA Director at University of Arkansas-Monticello. She is the author of Burning Tulips and A New Kind of Music. She has been published in hundreds of literary journals. More info can be found here. A great story; brutal and human all at once. And so very, very lifelike.